How is breast cancer diagnosed in pregnant women? What if I do have cancer? Will I have to lose my baby? Can I breastfeed my baby if I have breast cancer? I had breast cancer, but I have been successfully treated for it. Is it OK for me to get pregnant? Will this harm either me or my baby? Breast cancer is the most common cancer in pregnant women and tends to affect women in their mid-30s. Although only about 1 in every 1,000 pregnant women get breast cancer, the disease can be devastating to both the mother and her child -- so it is essential that pregnant women and their doctors continue to do routine breast exams and thoroughly investigate any suspicious lumps. 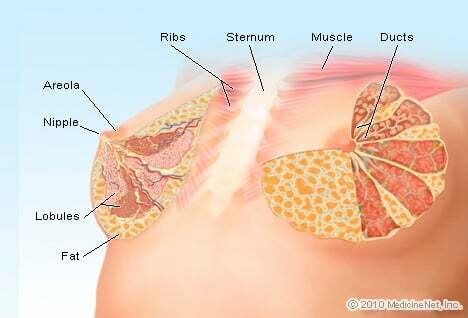 A major problem is that a lot of changes take place in a woman's breasts during pregnancy. This makes it harder to identify suspicious lumps. In addition, breast cancer tumors in pregnant women are often larger and more advanced by the time they are detected than lumps in women of the same age who are not pregnant. The best thing you can do while pregnant is to see your obstetrician regularly. These doctor visits, called prenatal (or "before birth") visits, are very important in keeping both you and your baby in the best possible health. During these visits, your obstetrician will perform a breast examination to check for suspicious breast changes. It is also important to regularly perform breast exams on yourself. Your doctor or nurse can teach you how to do this properly. If a suspicious lump is found, your doctor will likely ask you to get a mammogram or an ultrasound. As in all procedures that expose you to radiation when you are pregnant, the technicians will take extra care to shield your baby from radiation during the mammogram. If the lump is still suspicious after these tests, the doctor will usually perform a biopsy. In fact, your doctor will often recommend that you get a biopsy even if the initial tests come back negative. During the biopsy, a small sample of the suspicious tissue will be removed with a needle or by making a small cut. This sample is then thoroughly examined using a microscope and other methods to detect any cancer cells. First of all, abortion of the baby does not improve the mother's chances of surviving the cancer. Second, there is no evidence that breast cancer can harm the baby. What can harm the baby are some of the treatments for breast cancer -- and these depend on how far advanced the cancer is. This is another reason why it is so important to detect these and other cancers early. If the cancer is still in the early stages (Stage I or II), the doctor will most likely recommend that you have surgery to remove either the suspicious lump (lumpectomy) or the affected breast (mastectomy). During the operation, the surgeon will examine the lymph nodes to see whether any are affected and will (usually) remove the lymph nodes where the cancer is most likely to have spread. If is it necessary to give chemotherapy, your doctor will usually wait until after the first trimester to reduce the chances that it will harm the baby. If the cancer is more advanced (Stage III or IV), the situation can become very complicated. If radiation is needed to treat the cancer, it can be very hard to protect the baby. Additionally, these cancers usually require both surgery and chemotherapy, so the risk of harming the baby is much higher. There have been instances where the cancer is advanced to the point where any treatment is not likely to add more than a year or two to the woman's life. In these cases, whether or not to undergo the treatment and risk harming the baby can be an agonizing decision for both the woman and her family. Breastfeeding while you have breast cancer will not harm your baby. Moreover, there is no evidence that stopping your flow of breast milk will improve your cancer. However, if you are undergoing chemotherapy for breast cancer, you should not breastfeed because these powerful chemotherapy drugs can travel through your breast milk to the baby. Pregnancy does not change the overall length of time a woman who has had breast cancer can expect to live. At this point, it appears that babies born to women who have had breast cancer in the past are normal and healthy. However, it is possible that babies born to women who have had extensive radiation, chemotherapy, or bone marrow transplantation may have more problems. Some doctors feel that postponing pregnancy for two years or so after being treated for breast cancer will make it less likely that your cancer will come back while you are pregnant, and lead to the problems discussed earlier in this section.